Another Wood Driveway Gate made in Sarasota/Bradenton waiting to be shipped to West Palm Beach area of Florida. This and other similar wood designs need metal frame mounted at rear for automation . 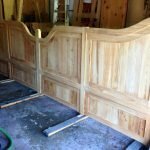 This Wood Gate is engineered for Florida climate ..We use a excellent local shipping company dedicated to personal service . Our Garden , Pedestrain and Driveway Gates can be shipped anywhere in Florida ..